When my family jetted off to Portugal for a week I was unable to join them as I had weddings to photograph at either end of the week. So I decided to take a camper van to Skye with my dog Emily for a few days in between. 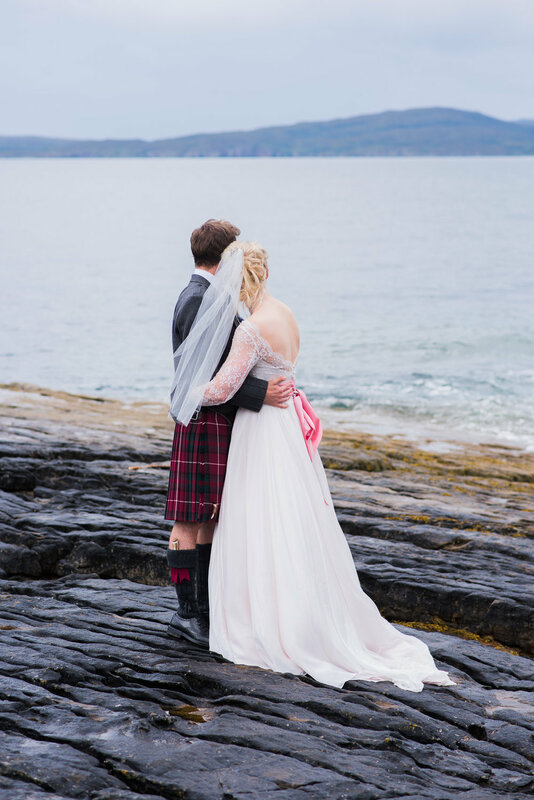 Then, unexpectedly, my friend Rosie from Love Skye Photography asked me for some help. 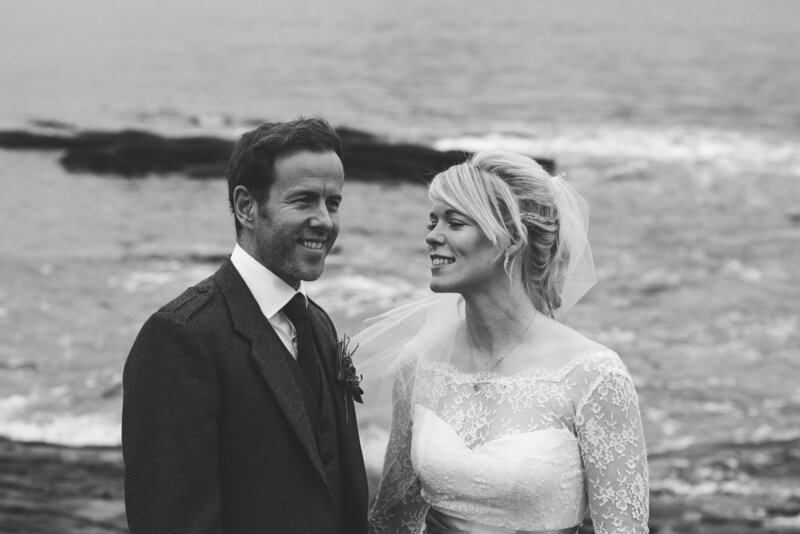 Rosie photographed Rona and Darran's wedding on the Saturday at Coruisk House, but unfortunately, the weather was so bad that they never made it over to Loch Coruisk. And so Rosie hatched a cunning plan. 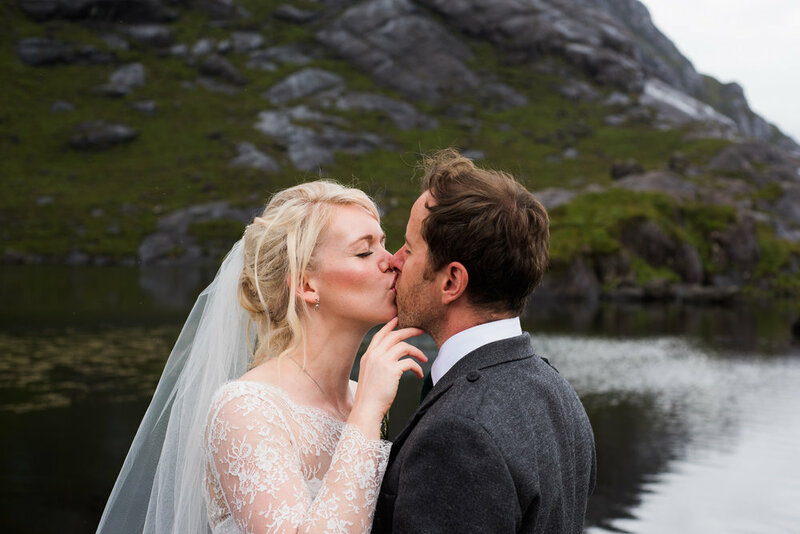 She was due to photograph another couple at Loch Coruisk on the Tuesday and asked me if I would mind photographing Rona and Darran. I immediately jumped at the chance as I'd always wanted to go on the Misty Isle boat trip! And Rona and Darran were delighted as it meant they got the photos they so wanted. Win win. 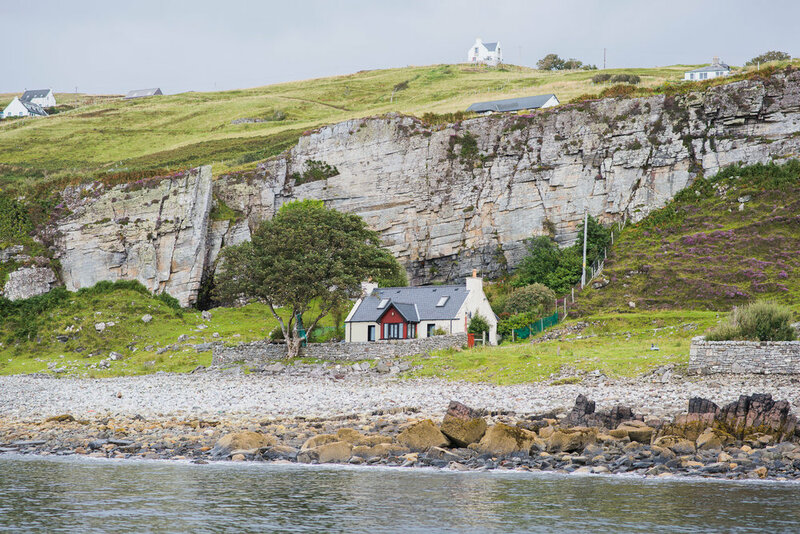 Rona and Darran were staying in a delightful little cottage just up from the shore at Elgol. 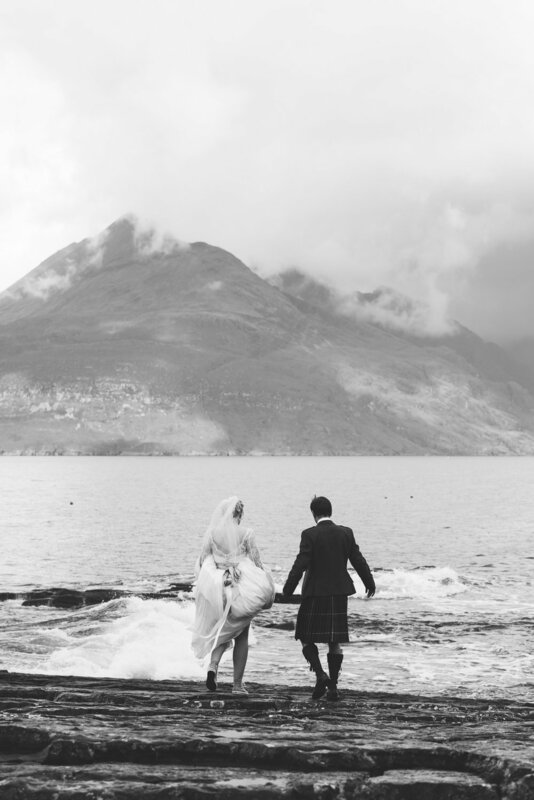 So we met them there for some photos down on the rocks overlooking the Cuillin Mountains. Before long the midges had set upon us and we got eaten alive! 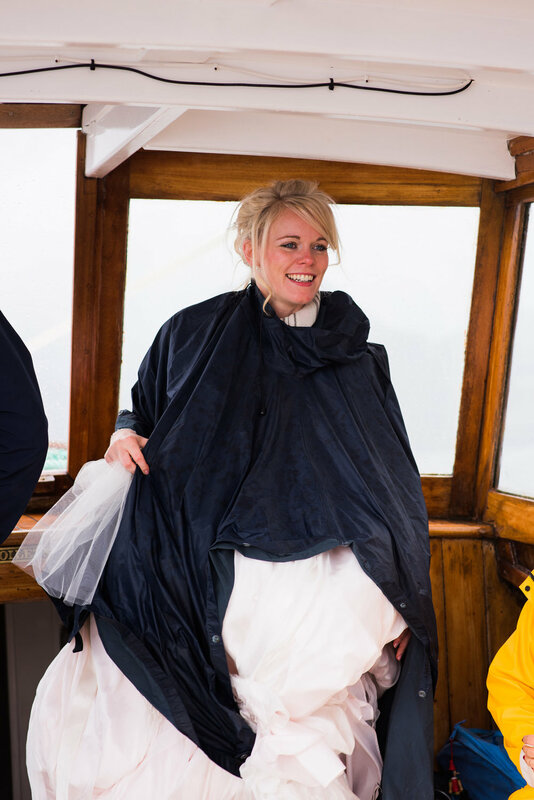 So off we went to join Rosie's other couple on the Misty Isle boat, dousing ourselves in midge repellent. On the way over, out of nowhere, the rain poured down and we were left wondering if this was going to happen or not. But they seemed to be just heavy showers as we sailed past seals lounging on the rocks. As we approached our mooring point, the heavens opened once more. We stayed on the boat for a good twenty minutes before the rain stopped and then we went for it. A little window of opportunity was greeted by an amazing break in the weather as we clambered over rocks to Loch Coruisk. Definitely a bucket list item ticked off the list for me. As we all climbed back on board the Misty Isle, we were served hot drinks and a piece of shortbread, a welcome snack on a cold and damp day. And we were almost greeted with a sight of dolphins on the way back, only to find they were porpoises. Rona and Darran, you were an absolute delight to photograph and I'm so happy I was able to help out and capture you both in a place you love. It was a pleasure to have met you both and it was a day I'll never forget. Oh and if you're wondering how Emily spent the day, Rosie's family borrowed her and took her on a huge walk.